I'm quite excited that Bluetooth Low Energy (nRF51822) is comming to mbed. So I'm exploring what we can do with BLE (nRF51822). Preparing tools to get started with new things is always the beginning. 1. use Arch as an mbed interface to run CMSIS-DAP. Quick press the button. "MBED" drive will pop up. 3. flash a hex file generated by mbed online compiler or application binary file to nRF51822. Great, so nRF51822 can be downloaded by a CMSIS-DAP interface. Can I program nRF via CMSIS-DAP debugger on FRDM board? And does it (nRF) have any ISP options like regular MCU does? 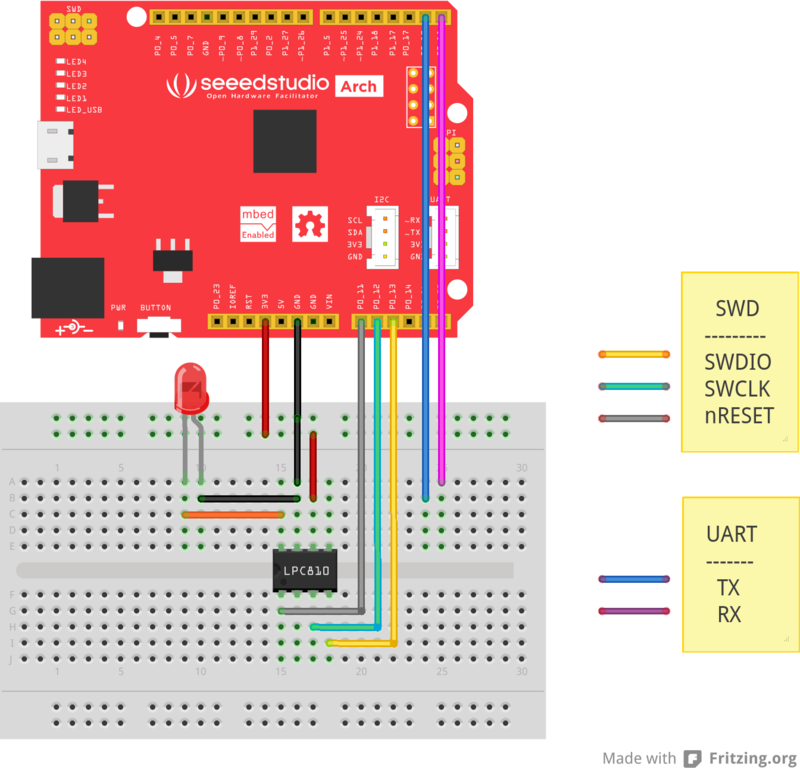 The nRESET & SWDIO are the same pin#23 on the nrf51822! but above you should that nRESET and SWDIO need to be connected individually! ,so How I'm supposed to connect in such a case? Hi Nishant, You can just connect SWDIO to nRF51822's nRSET & SWDIO. The script can reset nRF51822 through SWCLK and SWDIO. Can I program nRF via CMSIS-DAP debugger on FRDM board? And does it (nRF) have any ISP options like regular MCU does? Any CMSIS-DAP debugger supported by pyOCD can be used to program nRF51822. As I know, nRF51822 don't have a ISP options. <<quote allankliu>> Can I program nRF via CMSIS-DAP debugger on FRDM board? And does it (nRF) have any ISP options like regular MCU does? <</quote>> Any CMSIS-DAP debugger supported by pyOCD can be used to program nRF51822. As I know, nRF51822 don't have a ISP options. First, I download and oended project file "\CMSIS-DAP-xiong\interface\mdk\lpc11u24\lpc11u24_interface.uvproj" and I selected sub-project of "lpc11u24_lpc11u24_if", because I bought 2 Seeed Arch Board. "gpio.c: Error:  #5: cannot open source input file "..\..\interface\hal\TARGET_NXP\TARGET_LPC11U24\gpio.c": No such file or directory"
so I try to find that directory, but I can't. just there is "TARGET_LPC11U35" directory only. Something wrong? Please help me~ Thanks. Cool note, so I'd like to try to compile by myself of your CMSIS-DAP proect from your Github site ([[https://github.com/xiongyihui/CMSIS-DAP/tree/lpc11u24]]) First, I download and oended project file "\CMSIS-DAP-xiong\interface\mdk\lpc11u24\lpc11u24_interface.uvproj" and I selected sub-project of "lpc11u24_lpc11u24_if", because I bought 2 Seeed Arch Board. finally I compiled But, I met the error like: <<code>> "gpio.c: Error: #5: cannot open source input file "..\..\interface\hal\TARGET_NXP\TARGET_LPC11U24\gpio.c": No such file or directory" <</code>> so I try to find that directory, but I can't. just there is **"TARGET_LPC11U35"** directory only. Something wrong? Please help me~~ Thanks. Thanks yihui , can you describe what you mean by making a schmatics or Fritzing drawing? <<quote yihui>> Hi Nishant, You can just connect SWDIO to nRF51822's nRSET & SWDIO. The script can reset nRF51822 through SWCLK and SWDIO. <</quote>> Thanks yihui , can you describe what you mean by making a schmatics or Fritzing drawing? can I do it with mBed LPC11u24? instead of the Arch. Yihui, can I do it with mBed LPC11u24? instead of the Arch. can you describe what you mean by making a schmatics or Fritzing drawing? To use mbed LPC11U24, you need to add USB connector as the on-board USB connector is for mbed interface. <<quote Nishant>> Yihui, can I do it with mBed LPC11u24? instead of the Arch. <</quote>> To use mbed LPC11U24, you need to add USB connector as the on-board USB connector is for mbed interface.